Futohon colorful slime DIY kit for children and adult. Suitable for slime making, gift box filling, glass bottles DIY, floral DIY, baby dolls filling, art crafts ornament,and party decorations. What a decoration in your life! Easy mixing:During slime making, you just need to mix the Foam beads/Fishbowl beads/Slice/Shell and others with slime or just adding them on slime surface as a decoration. This amazing slime making includes all of the supplies and accessories that you need to make some home slime. Why not make your own, using exactly the colors that you want instead of the fixed styles? Foam Balls:made of EPS,multi-colorMore foam beads for slime = more crunchy slime blobs = more fun! The product contains no slime. Not suitable for the children under 3 in case that they eat it. Store or use the styrofoam ball in the place that do not have wind to avoid it blew away. 100% Satisfaction and Money Back Guarantee - Please check your items before ordering! 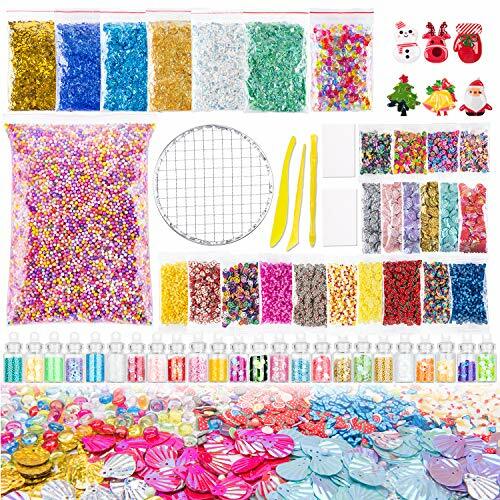 ✔ A Perfect Combination Slime Supplies Kits - Total 57 Pack with 7 Christmas Resin Toys,mainly include 24 glitter jars,6 colors sugar papers,6 colors shells,14 pack cake flower fruit slices,24 glitter jars,1 pack multi-color fishbowl beads,1 pack colorful slime foam balls,1 net（for pressing） and 2 pieces of sponges(cut into pieces and mix)!Customize your slime according to your preferences. ✔ Large amount slices with 14 Packs - More slices for slime = more fun!They are decorated with various colors and lovely shapes such as fruits, flower, butterfly and cakes,meet children's colorful fantasy,make it different and unique.Good for kids to DIY & decorate their own slime supplies kit and holding a fantastic slime party. ✔ Wide application slime kit - can be used as weddings, birthdays, baby showers and celebration decorations for making mucus, vase filling, gift box, flower arrangement, DIY craft, house decoration, etc., make these occasions special and charming, and absolutely light up your children slime party and leave you a memorable moment. ✔ An Amazing Slime Kit For Relaxing - It can be used with slime to relieve the pressure or work as a decoration in daily life.Foam beads,slices,shells,glitter jars and many others are colorful, buoyant and hard to crush,bring you a good feeling when you are making slime DIY. They're soft and long lasting brilliance, will not dye, great as a DIY slime decoration.So,they are awesome for art crafts ornament and decorate your own life. ✔ Gift Ideas & 100% Satisfaction Guarantee - Really a nice gift for your families,your friends,your kids and your colleagues.Imagining their smiley face when they get this big surprise and you just bring them endless fun!Please be assured that slime kit is backed with a 12-month Warranty and 100% Satisfaction Guarantee from products to service. View More In Beading Kits. If you have any questions about this product by Futohon, contact us by completing and submitting the form below. If you are looking for a specif part number, please include it with your message.